A morgue is an unlikely place of pilgrimage but there’s reason in the case of the Churachandpur district hospital in Manipur. It houses the bodies of nine people killed in police firing more than a year ago but still not interred as they have become martyrs in a cause that has divided an already fraught society. Inside a makeshift structure of wood, tarpaulin and tin, a group of around 50 people sat on benches, praying loudly. At one end, a woman sang and moaned and cried, exhorting the faithful. There was a long banner with photos of the nine “martyrs” with bouquets of flowers beneath. “We’ll never forget those who gave so much to remember,” said a line at the bottom of the banner, as well as “Voice of the people is the voice of God”. The group was praying for inspiration for their struggle. Mang Guite, a reporter for the local newspaper, The Sangai Express, told me the women’s and youth groups had been against the burial all along. But as with much else in the Northeast, the closer one gets to the scene, the more complicated things become. The story begins on August 31, 2015 with the passing of three bills in the Manipur assembly, routine legislative business at first sight. The bills were linked to the demand for something similar to the Raj-era Inner Line Permit (ILP) system, which still controls the entry of Indian citizens into Arunachal Pradesh, Nagaland, and Mizoram. But in the state’s hill areas it inflamed public opinion, particularly in Churachandpur district, which saw violent protests. As a result, the President withheld consent to the bills. The situation has not changed much since, though the bodies are a reminder of how strongly feelings run in this matter. The ILP, introduced as the Bengal Eastern Frontier Regulation, 1873, is seen now as an instrument that protects the tribes in the three states. The British introduced it in order to restrict the entry of their subjects in the hills, leaving the tribals to their own devices in “excluded areas” behind an “inner line”— after tea plantations opened in the Assam valley. The ILP, introduced as the Bengal Eastern Frontier Regulation, 1873, is seen now as an instrument that protects the tribes in the three states. The British introduced it in order to restrict the entry of their subjects in the hills, leaving the tribals to their own devices in “excluded areas” behind an “inner line”— after tea plantations opened in the Assam valley. They were wary of raiding parties coming down from the hills. 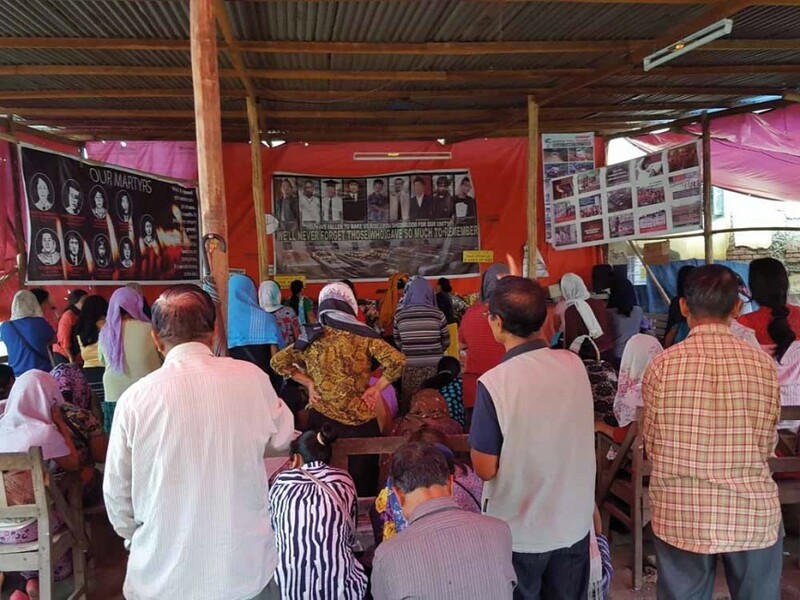 Along with the demand for an ILP-like system was another one for Scheduled Tribe (ST) status for the general category Meetei community of the Imphal valley. On September 18, 2016, a rally of one lakh people loudly supported it. Neither demand is new to the northeast; Meghalaya and Assam have recently seen political parties calling for the ILP. A dozen communities in Assam are agitating for ST status. Both are seen as offering safeguards for indigenous people in the face of migration from outside. But in Manipur, the issue is complicated by the political differences between hills tribals and the Meetei in the valley. The tribals fear these demands are the first step to Meetei laying claim to reserved land in the hills. Many Meetei believe it unfair that people coming from outside, and tribals from the hills, could purchase land in the valley (being a general area) while people from the valley couldn’t do that in the hills (being protected tribal land). If the ILP came into force, or if the Meetei got ST status, people from outside the state would no longer be able to buy land in the already overcrowded valley (population density is estimated at more than 700 per sq. km in the four valley districts, and less than 100 per sq. km in the five hill districts). In Manipur every agitation is led by a joint action committee; the ILP is no exception. Only, in the matter of the martyrs concord had broken down, not an uncommon development in this divided state. The Kuki groups in the Joint Action Committee (JAC) “against the three bills” had given a deadline for the burial of the “martyrs”. They exited the JAC after the Kuki National Organisation (KNO) withdrew support when the deadline was ignored. It happened after the house of the Zomi Revolutionary Organisation’s (ZRO, related to Kuki but also different) president in New Lamka was torched four weeks after the violence by a mob when rumours surfaced that the insurgent outfit had asked local MLAs to resign over the passing of the bills. The KNO is an umbrella body of Kuki insurgent groups demanding a separate Kuki state in Manipur, something the Naga organisations oppose. On the afternoon before Diwali last year I found myself at the Martyr’s Gate in Imphal. “Lengshinbirak o, lengshinbirak o,” a man with a mike called out: in Meetei it is a formal way to say “welcome”. The gate is the entrance to Bir Tikendrajit Park, beside the famous Mapal Kangjeibung or polo ground. Next to the announcer, several middle-aged women from the Scheduled Tribe Demand Committee, Manipur (STDCM) were showing people where to sign and fill in details on forms. The place was crowded with Diwali shoppers thronging the nearby Ima Keithel or mothers’ market. Anandameetei, 47, convenor of the STDCM’s publicity committee, a bespectacled man with a ready smile, said they had collected over 5,000 signatures in five days. This was the sixth and last day at the Martyr’s Gate (Bir Tikendrajit was hanged here by the British in 1891). They planned to take the campaign to different leikai or localities in Imphal after that, and to districts in the state. Anandameetei said the majority of Meetei wanted ST status, pointing to the attendance at the September 18 rally. When I asked him about the opposition from tribals in the hill areas (which cover about 90 per cent of Manipur) he said it would benefit everyone if all 36 ethnic groups had one common status. Some groups, he said, automatically opposed anything done by the Meetei, an indication of the state’s contentious politics. On my last day in Imphal, I had been woken by a loud explosion just around the corner from my hotel in Thangal Bazar. No one was hurt, but a car was damaged. I saw Manipur Police commandos milling about, pistols in thigh holsters, H&K submachine guns and AK-47s slung on their shoulders. An old carpenter’s tool bag was being checked under a garlanded statue of Gandhi. No one seemed unduly bothered: it was business as usual. I was reminded of things I thought I had forgotten from almost two decades ago: having to get down from buses in Assam and line up while army jawans carried out checks, and Shillong turning into a ghost town as darkness fell. The police later claimed the Imphal blast was linked to an extortion attempt. My contact, a freelance journalist, thought the police themselves were responsible, an indication of the general lack of trust in the security forces. I had reached Dimapur a week earlier, on a night train from Guwahati. The sun had risen as the train sped past fields, patches of jungle, clearings with tin-roofed huts, and small train stations. Dimapur, commercial hub of Nagaland on the border with Assam, hadn’t changed: dusty potholed roads, SUVs, and stylishly-dressed youth. I stayed two days before travelling to Imphal via Kohima by road. I had earlier got an ILP from Nagaland House in Shillong just in case, but nobody checked the permit on the highway. In Dimapur I met a friend who talked about the “tax” he paid the NPGs or national political groups for his commercial vehicles. “The NSCN-IM are systematic and organised,” he said. “They have different rates based on the model and make of commercial vehicles.” He showed me a photo of a “tax receipt” for the current year on his phone. It was possible to pay less, but then you would only get an unofficial parchi (receipt). In the Dimapur area there is a large population of “IBIs” or illegal Bangladeshis at Khatkhati on the Assam border. I met two members from ACAUT (Against Corruption and Unabated Taxation), an organisation of Naga businessmen and professionals working to stem corruption in the state as well as “tax collection” by the NPGs. There were instances of the NPGs using these IBIs as collection agents. Mar Longkumer, an Ao Naga and ACAUT’s information and publicity secretary, told me how they had started. By the year 2013 tax collections by various NPGs in ceasefire agreements with the GoI had reached new heights, and businessmen and professionals in Dimapur had no one to appeal to. After a meeting of the Dimapur Chamber of Commerce and Industries and the Naga Council, Dimapur, they decided to approach the main NPGs, including NSCN-IM, to find a solution. The NPGs asserted their right to collect tax, pointing out that various government agencies were collecting illegal payments as well. This made ACAUT start looking into corruption in the government. On October 31, 2013 they held a rally in Dimapur (which NSCN-IM had tried to stop) where they announced the formation of ACAUT and its main aims: an early settlement of the “Naga political issue”, and payment of a single tax. With popular support on their side, said Longkumer, NPG cadres had become more polite while asking for tax, and the fear of earlier years was gone, along with the syndicate system in various commodities. But the payments had not stopped. My friend said he usually paid an annual amount per vehicle to IM, the Unification or Khehoi faction of NSCN, and the K faction, but as the latter had broken the ceasefire and its cadres were no longer around, he was saving some money for the time being. 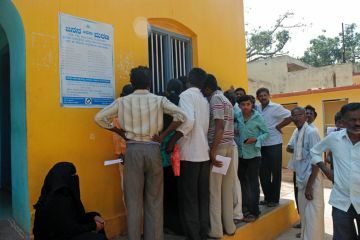 The NPGs also collected entry tax from trucks, taxes on every trip from commercial vehicles (police and excise collected separately), house tax, salary tax ranging from 10 to 24 per cent, and a 5 to 15 per cent tax on government projects (if they didn’t enter into a partnership with the contractor). The best engineers and mechanics were Meetei, my friend told me, but local Naga youth handled his vehicles to avoid problems with NPG cadres. I got a taste of this myself when I left Dimapur. Icaught an Imphal-bound van early in the morning near the Hong Kong market. Past Chumukedima the road started climbing, with the Chathé river appearing below at the bends. We crossed old Shaktiman trucks, with faded dark-green paintwork and missing bonnets, hauling boulders and logs. Here and there amid the jungle were strips of rice fields. There were landslides in the subsidence-prone section below Kohima, and slow traffic up through the dusty capital where we switched to National Highway 2 or NH 2. 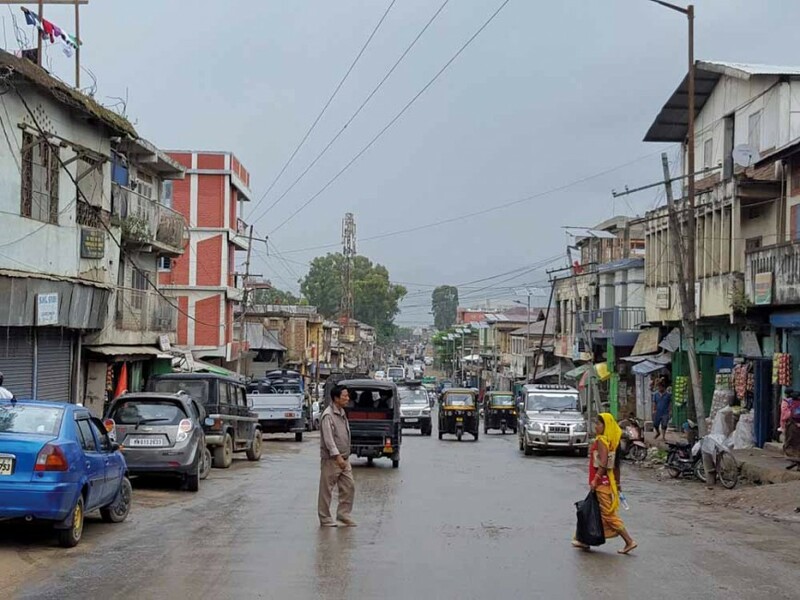 Traffic policemen collected money at two places in Kohima from the driver (it was a Manipur-registered vehicle), then at Khuzama (after Phesama gate) the driver paid at three more gates, including police and excise. Just before Mao Gate on the inter-state border three men in jackets, pollution masks covering their faces—cadres from one of the NPGs—collected from him as well. 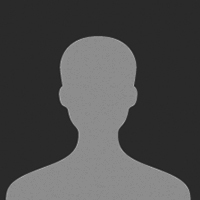 In all, a Winger driver headed from Dimapur to Imphal pays about Rs. 500-1,000 per trip in various “taxes”, in the stretch between Kohima and Mao Gate. After lunch at Mao Gate we set off again, negotiating broken patches and potholes. Past Maram, the winding Barak river came into view down below on the left, and then terraced rice fields turning yellow on the hills. The harvest season had started. We passed Senapati, where there had been a flash blockade the previous day. Eventually we reached the Imphal valley after about seven hours. The friend who received me at Imphal was carrying a licensed pistol with him in the car. He looked after the family enterprise, and a valley-based group, one of the state’s 30 plus insurgent factions, had called asking for contributions. “If they use the money to fight I might pay them,” he told me. “But it’s meant for them and their families in Myanmar, so why should I pay?” But he conceded that the situation, in Imphal at least, had improved compared to five or six years ago. An armed struggle to regain the glories of a lost kingdom had come down in the end to extortion of its own people—a tale similar to Assam. The temporary office of the Extra-judicial Execution Victims’ Families’ Association, Manipur (EEVFAM) is on the second floor of the Cheirap court complex in Imphal. I had met its founder-secretary, Neena Ningombam, a few years ago at a conference in Pune. 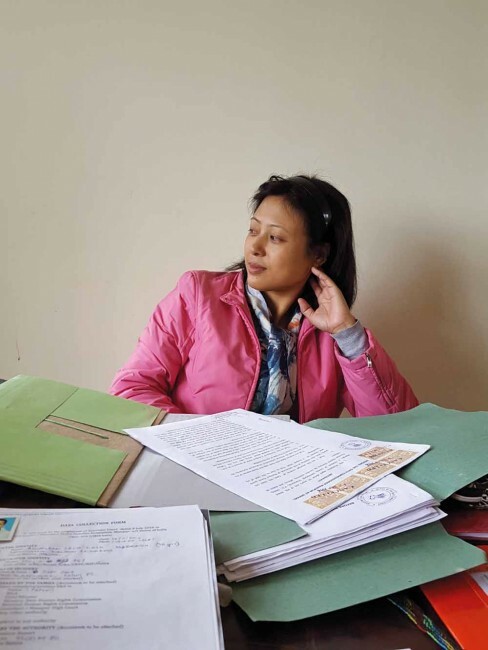 Her account of how her husband Nongmaithem Michael, then 32, had been picked up from his locality of Keishampat on November 4, 2008, by Manipur Police commandos and shot dead had silenced everyone in the room. I had met her again briefly on a previous trip to Imphal. Now, in the large room, empty except for a few tables and chairs and a steel cupboard stacked with files, she was assisted by Seher and Rohit, two volunteers from Chennai and Kolkata respectively, in the EEVFAM’s attempts, following a July 2016 order by the Supreme Court, to provide details of 1,528 extrajudicial killings in Manipur from 1979 to 2012. They had traced relatives or friends in more than 800 of those cases, collected complete details of 215 cases, and while hearings had taken place at the state high court and NHRC in 62 cases, compensation had been paid in only 32 cases. Some older cases had been dug up, too, like that of Asumbo Pamei, 22, from Luangdi village in Tamenglong, allegedly killed by troops on February 2, 1962 at Karembangning near the Barak River. The “informant”, after so many years, was his father. The July 2016 order followed a report by the Hegde Commission, which examined six cases and found not one could be termed an encounters or self defence, i.e., all six were extrajudicial killings. Not one of the persons involved in the army or paramilitary had been found guilty; as for the police, there had been a few selective cases of suspension. The years 2008 and 2009 had been the worst, Ningombam told me, with regular reports of tortured and bullet-ridden bodies on the outskirts of Imphal. Her husband had been one of them. “They just became addicted to killing people,” she said. Now she stayed with her in-laws, looking after her two sons. 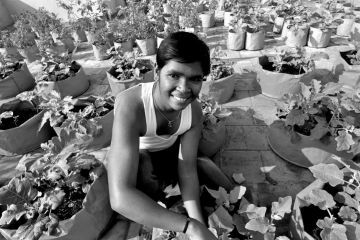 Her mood brightened when I asked about them, and she showed me a photo on her phone: the eldest, in class 9, was already taller than her. She said he wanted to study science; she wanted him to get into a football academy. Seher, interning with the Human Rights Alliance, said she initially had to stop every few moments, overcome with horror. Rohit, a National Institute of Design student doing a photo story on Manipur, had been in Imphal for about a month, and was struck by the social status and organisational capabilities of Meetei women. As we spoke, the journalist was talking to Ningombam. In Meetei she was louder, more confident, and livelier. The deadline for collection of details had been extended till the end of the year, she said. A contact tried to put me on to B. K. Moirangcha, convenor of the Joint Committee on Inner Line Permit System (JCILPS). The JCIPLS supports the implementation of the ILP system in Manipur. Moirangcha said he was in a meeting and would let us know when it was over. This would be the stock response of the JCILPS, and they eventually stopped taking calls. Their phones were switched off. After days of pursuing them, I would eventually give up on meeting its members and resort to sending an email, which went unanswered. They had reason to be wary. Their former convenor, Khomdram Ratan, had gone into hiding after police accused him of being a member of the banned UNLF (United National Liberation Front, one of the five main valley outfits, each with factions of their own). We lunched at one of the chak or rice hotels. Manipuri cooking uses many herbs, like maroi or chives for instance, and it makes the food more of an acquired taste than, say, typical Naga fare. 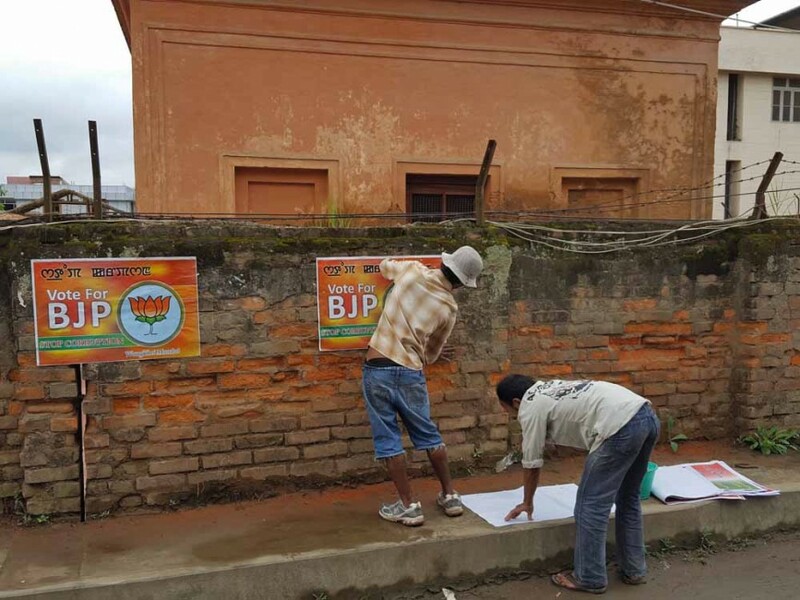 Across the road, two men were pasting BJP posters on the wall. The state elections were to be announced for the end of January or early February. Having been a symbol for so long, it was apparently difficult for people to accept her as a human being with her own reasons and desires. There was also a general consensus that she would be out of her depth in the murky waters of Manipur’s politics. ACAUT had spoken of massive corruption. The chief electoral officer said there were about four lakh bogus voters in the state. The most recent instance of corruption was people caught red-handed by police and ACAUT adulterating fuel with kerosene at Dimapur petrol pumps. The main accused were out on bail, while one of them had been caught while on bail trying to take a kerosene tanker to Manipur, apparently for adulterating black market liquor. Through RTI applications, ACAUT had found that from 2003 to 2015, from the total of 20 crore litres of PDS kerosene, 12 crore litres with a market value of Rs. 500 crore had gone missing. Similarly, they allege that 57 crore kg of wheat (with a market value of about Rs. 1200 crore), supposed to have been supplied to Nagaland (a largely rice-consuming state) had been diverted to the black market. Food and Civil Supplies department records for 2003–07 showed that 15 crore kg more wheat had been distributed than was supplied by the Centre. This portfolio has been held by the chief minister all these years, and ACAUT says thousands of crores’ worth of PDS items like rice, wheat, sugar, kerosene etc. have been systematically diverted over that time by “syndicates of carriage contractors, local Nagas acting as fronts, politicians, the department, and businessmen from outside”. ACAUT’s legal adviser, who didn’t want to named, said Nagaland was an Opposition-less state, with assembly sessions lasting about 15 minutes. Then there was the matter of thousands of backdoor appointments in various departments, including the police. Between “tax” collection and government corruption, there appeared to be a complete breakdown of administration itself. My friend in Dimapur had also favoured the BJP because, as in Assam, after three consecutive terms anti-incumbency—a polite term for total misgovernance—handicapped the Congress government of Ibobi Singh. He too didn’t expect Sharmila to be much of a factor. A settlement has long been expected between the Centre and the NSCN-IM, and word was it could come after the elections in 2017. That evening we went to Dewlahland, a leikai near the inter-state bus terminus with a large tribal population: the old Meetei name was Kabo leikai. I was meeting a student from Ukhrul, a Tangkhul Naga. He was to connect me to someone from one of the Naga student groups. He and his elder brother (neither wanted to be named) who had taken a transfer from Mumbai had rented a place in a newly completed building. The younger brother was sitting for competitive exams. The Tangkhuls are perceived as an educated community. They were also traditionally associated with the upper-rung leadership of NSCN-IM. Seth Shatsang, president of the All Naga Students’ Association, Manipur, was also at the brothers’ flat. A slim figure in jeans, his hair was cut short on the sides and was slightly long at the back, something akin to the traditional Tangkhul male hairdo. In his opinion, the demand for ILP in Manipur was unjustified. In the hills, which mostly belonged to Naga tribes under their customary land laws every village was an independent unit with its own territory. One of the three bills passed by the Manipur Assembly mentioned original inhabitants based on the 1951 census, after Manipur’s merger into the Indian Union, and Shatsang said the census had missed out villages and their residents in the hills (Kalinamai in the Mao area and Longpi in north Ukhrul were two examples he gave). “The ILP demand was initially about outsiders, but the bills are about land.” Shatsang was dismissive of the Meetei ST demand: “They have been a caste-based society (with SCs and Brahmins) since the Bengali Hindu missionary Shantidas Gosain converted their king Pamheiba (Garib Nawaz) in the early 18th century,” he said. “How can they now say that they want to be tribals?” I was now beginning to get a sense of the hill–valley divide that people spoke of. Another resident I had met, S. Singh Yambem, said, “I don’t think ILP will make much difference. But getting ST status would lead to a loss of competitiveness among us general category Meetei.” He had been fourth on a list of seven general category candidates for the RBI in the mid-1970s. The hill-valley divide, he said, had come about with the British, who after conquering Manipur in 1891 had introduced a system of dual administration for the valley and the hills. He pointed out that there was also a strong urban–rural divide in the valley. I thought that could was partly due to the monarchical system and the Brahminism that had taken root among the Meetei elite. Indeed, this class divide seemed partly responsible for the youth taking up arms (a majority of the 1,528 EEVFAM cases, for example, involve those from the weaker sections of society). His comment about the competitiveness of the Meetei I understood. There is a large diaspora across India and the rest of the world. And it came from personal experience too: their brother Jupiter Yambem had been the manager of a restaurant on the 106–107th floor of the north tower of the World Trade Center in New York, one of the first known Indian fatalities in the 9/11 attacks. The next morning we set out for Churachandpur, some 60 km south-west of Imphal on NH2. Theoretically, it was possible to continue to Aizawl in Mizoram on NH2, some 360 km away; theoretically because after Churachandpur the road was terrible even by the standards of the Northeast. There were Sumos that made the trip, though. The highway from Imphal was arrow straight: past the airport buildings and shops dropped away and huts and ponds appeared, followed by familiar place names, Nambol and Oinam and Moirang, with their potholed roads, dusty shops and houses, mud-splattered marketplaces, and the remains of years of conflict. Churachandpur is a small town spread out over the low foothills. A local photographer took us to a large house on the outskirts with a view of the cloud-wreathed dark green hills nearby—across those hills was Mizoram. The owner was sitting outside with some people; a grave-looking man in white t-shirt and glasses; Hauzel Mangchinkhup, 50, a social worker and chief convenor of the JAC against the “anti-tribal bills”. Why were the bills anti-tribal? “They infringe on tribal rights guaranteed constitutionally,” he said, “the ILP cannot come about in Manipur which is a Meetei majority, general category state.” But he favoured the ILP in the valley. Like Shatsang of the ANSAM, he said the three bills—passed by the state assembly bypassing the Hill Areas Committee—had moved away from ILP and gone into ownership of land. The chief of Bungmual then was Mangchinkhup’s grandfather; among the Kuki–Chin–Mizo (which comprise the larger Zo group) villages were ruled by hereditary chiefs, whereas among the Naga tribes, there was a more republican form of government with the council of elders. The fact that Mangchinkhup had once been a secretary in ATSUM (All Tribal Students Union, Manipur) now made a lot more sense. I asked someone I knew in Churachandpur town and they confirmed the point about Mizos moving back to Mizoram. They also said many Paites from Myanmar had settled in New Lamka (Lamka is another name for Churachandpur). Then there were the Kuki who moved to Churachandpur in the mid-90s after the bloody clashes with NSCN-IM. In 1997–98 there were clashes between the Thadou Kukis and the Paites. Interestingly, The Telegraph newspaper on November 2 quoted Mizoram CM Lalthanhawla as saying that the bills were “anti-migrant”. Indeed, he said he was speaking up out of concern for “the well-being of the Zo brethren”. Churachandpur is for now the resting place of the nine “martyrs”. A new bill was being drafted by the state assembly, but Mangchinkhup said the “imbroglio” resulting from the three bills, including the resignation of the six district MLAs should be resolved before the bodies were buried. The hospital morgue didn’t have cold storage facilities, he said, so for the first three months they got ice from Moirang and Imphal, and even had an air conditioner installed. Posters of the nine “martyrs” could be seen in the town, and at one place you can see nine symbolic coffins lined up. Mang Guite met us there. I asked him about August 31, 2015. He said there were apprehensions about the bills before they were passed, and when Churachandpur student leaders went to the residences of the hill MLAs in Imphal, they found them vague and uninformed about the bills. A bandh was called on August 31 by the KSO (Kuki Students Organisation), ATSUM and ANSAM, and effigies of the six MLAs and Ibobi Singh were burned in front of the ZSF (Zomi Students’ Federation) office. By then a crowd of several hundred agitated people had gathered and emotions were running high. The crowd had set out for the MLAs’ residences, some of which were in New Lamka, and set them on fire, attacking fire engines and police when they came, setting several vehicles alight. The police opened fire, killing three people. The next day, when a mob tried to storm the police station, the police fired again, killing three more. Two others died trapped in the buildings they were attempting to burn (one in hospital in Imphal), and another when he drove his bike into a roadblock. Land and identity, religion and politics all intersected in Manipur. A place where decades of conflict had crippled the economy, as populations grew, the competition for scarce land, jobs, and resources would only intensify. Already there were young people from the hills working in low-paid jobs in the metros to somehow get by. I met girls like that about two years ago in Delhi’s Hauz Khas Village, from Zou, Tangkhul, Hmar, Paite hill tribes, working in the small designer shops. All had the same thing to say: there was nothing back home, except maybe work in the fields, which they didn’t want. Back in Imphal we went around trying to locate people from the ST demand group. The office was in a leikai in the Uripok area, a single room with tables, chairs and a whiteboard, above a narrow spiral staircase outside someone’s residence. Inside were several middle-aged men. I spoke to Ranjit Singh, a reader in the department of geology at the DM College of Science, Imphal, and retired colonel Lokendra Singh, general secretary of the group. The ST demand picked up after the ILP demand was turned down and now the group membership comprises academics, bureaucrats and professionals. Back in my hotel, I went through their vision document, which the colonel had mailed me. Among its various points was one which said that the Meetei identified themselves as “yelhoumee” (original inhabitants or indigenous people) of the valley—which covered only 10 per cent of the state—but that they did not enjoy any constitutional safeguards as indigenous people. Lokendra Singh told us the reasoning behind the ST demand. “Long ago the valley was supposed to under water. In our mythology, the elder brother stayed in the hills, while the younger brother came down to the valley after the waters receded. That is why in mid-October, after the rains, we have the custom in the valley of raising lamps on bamboo poles, to let our brothers in the hills know we are safe. Several tribes would have been consolidated into one as the Meetei.” In 1891, after the political agent Grimwood and four other Britishers were killed during negotiations at the king’s palace, the British decided to take over, and the Khongjom war took place, following which Manipur was given the status of a princely state. The first census mentioned the Meeteis as a “forest tribe” (the valley would have been heavily forested then) who followed a mix of Hinduism and the old religion which held Sanamahi to be the Supreme Being. The 1901 Govt of Assam census listed them as the “main tribe of Manipur”, while the 1931 GoI census described them as a depressed class who had adopted Hinduism but followed their old traditions. After Independence, some 565 princely states were merged into India, including Manipur and Tripura in 1949. As Parratt describes in Wounded Land, by then a new class of Meetei Brahmins had spread an elitist form of Hinduism, which included people being declared “mangba” or unclean on account of non-payment of fees for ceremonies and rituals (further payment was required for them to be readmitted as sengba or clean). Singh said those who refused to become Hindus were exiled to the outer edges of the valley, along with those punished for crimes—these became over time the SCs. In 1950, Lokendra Singh said, the Minority Commission arrived to look into classifications for ST, SC and general categories. The king and his relatives, and the well-to-do and educated class, most of whom were supporters of the Congress Party and of merging with India, declared the Meetei would opt for the general category. Implicit in this decision was the perceived superiority of Meetei culture over that of the hills. The people in the hills were listed as STs, widening the divide that started with the British separating the administration of the valley and the hills, and the coming of Christianity. Singh believed once the constitutional divide was removed and all Manipuris were put on the same platform, integration would follow, even if it took decades. “My grandson sits with a Tangkhul boy in class, they will grow up as equals, but once they go to college and quotas come in, they will see each other as different people. This segregation should be removed,” he said. On my last day in Imphal, I met the legendary Ahanthem Romen Kumar Singh, retired DG of Manipur Police. His house with a high wall and gate was down a narrow lane in Ahanthem leikai. He was at his desk in his spacious study, surrounded by law books piled high, post-its sticking out of them—after retiring he had gone back to the law, helping people with their cases. He had passed his LLB from Lucknow University in 1973 before joining the police in 1975. Romen Kumar had been SP of undivided Imphal district and present when the Tangkhul Naga CM Rishang Keishing was ambushed by the NSCN-IM at Leishi in Ukhrul district on December 10, 1981. “I remember the date as it was my son’s birthday,” he said. At 71 he is tall and straight-backed. “I was myself ambushed four times, but nothing happened to me.” He had an operation to remove grenade splinters in and around his eyes. During one of the ambushes, his jeep was riddled with 47 bullets. He was closely associated with the feared Manipur Police commandos. Their tough and at times brutal tactics beat the valley insurgent outfits back. But he didn’t have kind words for anyone in the present time. “The cadres of the outfits in the 70s and 80s were educated and disciplined—now they’re only after money. The police are no better, they use cadres out on bail to create new factions to extort money, from which they take a share.” Locals say recruitment into the police and IRB is by fixed rates: Rs. 25-30 lakhs for an ASI, Rs. 5-10 lakhs for a rifleman. Once inducted, they have to recoup that money, including by collaborating with the groups. According to him, Hinduism in the valley, and Christianity in the hills contributed to the division. “Some say that even the hill people were to have been converted to Hinduism, but most didn’t have the one rupee coin to pay the fee, so it wasn’t carried out.” As for the ILP demand, he said a valley-based outfit indirectly supported it. We returned to Martyr’s Gate, the site of the signature campaign. Whatever the political leanings of the Meetei, they seemed ready to embrace ST status. Irom Michael, 29, had signed, and said there seemed to be a BJP wave coming in the elections. “Our politicians don’t work for the people,” he said with a smile. In the time I wrote this story there was familiar news out of Manipur. With the “economic blockade” continuing, the Manipur government arrested the UNC president, even as it arranged for armed escorts for some Imphal-bound goods trucks stranded on the highways. Whereas earlier such blockades were lifted after payments were allegedly made, this time, with the elections approaching, the “wily old fox” Ibobi Singh (as some refer to him on social media) has decided on a confrontational path to polarise votes between the Nagas and the other communities. He went ahead and announced the creation of not just two but seven new districts (from the existing nine), evoking sharp reactions from the UNC of intruding on Naga “ancestral lands”, as well as attacks by suspected Naga groups on the Manipur Police. This in turn led to Ukhrul-bound vehicles from Imphal being burnt by mobs. The result was a curfew and suspension of internet services in areas of the Imphal valley. The Centre has sent an additional 4,000 paramilitary troops to the state, even as the Naga Students Federation of Nagaland announced a “total blockade” of all Manipur-bound vehicles through Naga areas. While Ibobi Singh blames the Naga groups for the worsening situation, the UNC has demanded President’s Rule in the state and the state BJP has demanded the removal of NSCN-IM camps from the hills. With a shortage of essential commodities and fuel in the state, it looks like the situation will only get worse as the elections draw near. Correction: The print version of the story incorrectly stated that the Kuki national groups were part of the Joint Committee on Inner Line Permit System. 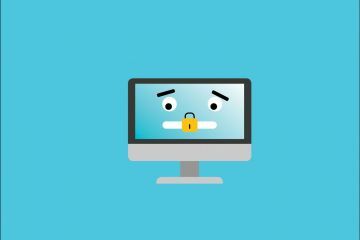 Tanzania’s latest anti-free speech rules require bloggers to pay a hefty licence fee and subject themselves to writing things that don’t annoy the regime.